Sandyfoot Farm is owned and operated by Gavin Sanderlin and Meredith Atthowe. It is a 40 acre family farm in Prince Edward County, located near Pamplin, Virginia. We have about 7 acres of sandy loam bottomland which we have fenced with 8′ deer fence. We have established a quarter acre of perennials and the rest of our land is rotated between annual vegetable crops and cover crops. We have many acres of cut-over forest which has grown back with small sapling oaks in need of thinning; they are the perfect size for shiitake mushroom production. Prior to our stewardship here, this land was a homestead and has grown vegetable crops, tobacco, hay, and cattle. We occasionally find arrowheads and other remnants showing us that our land has been feeding folks for quite some time. Our goal is to create a sustainable and diverse operation that enables our land to nourish and delight local eaters for generations to come. We are the farmers of Sandyfoot Farm. 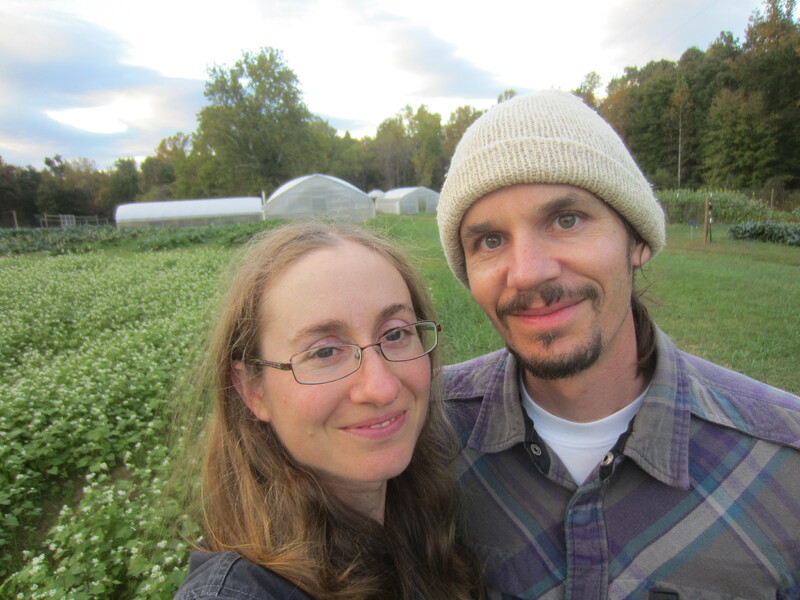 We met in 2002, and started our relationship by co-managing a small, viable community-supported vegetable farm in Goshen, Virginia for two years. We gained a lot of experience during this time, selling produce to area restaurants, farmers markets, and running a CSA (community supported agriculture) program. We were convinced we could make an honest living growing food and had a vision to create a farm of our own. We both grew up in Virginia and were ready to put our roots down, but as first generation farmers we needed to first find land. We began the search and after five years we finally found and purchased a beautiful property in Prince Edward County in 2009. We worked off-farm jobs for many years while slowly establishing our farm business. We began building our soils and establishing infrastructure in 2010. In 2011 we became vendors at the newly-created producer-only Forest Farmers’ Market. 2012 was our first year running our CSA program, which over the years through feedback from our customers has become our pre-order farm share program. We have been very fortunate to have the support of many folks at our markets and throughout the community. Each year we get a little better at what we do, and we are always learning. Starting a farm from scratch takes a lot of time and patience, but we are committed for the long haul. We’re passionate about our work here, and we hope to share that joy with you through the food we produce.